I have to say that I love these bags. I know it seems a little crazy to love a snack bag, but I do. These are very easy to open for little hands and the colors are bright and vibrant. I was impressed with the amount of snacks that they held and how well the stayed close even in my purse, that I seem to dig through multiple times a day. 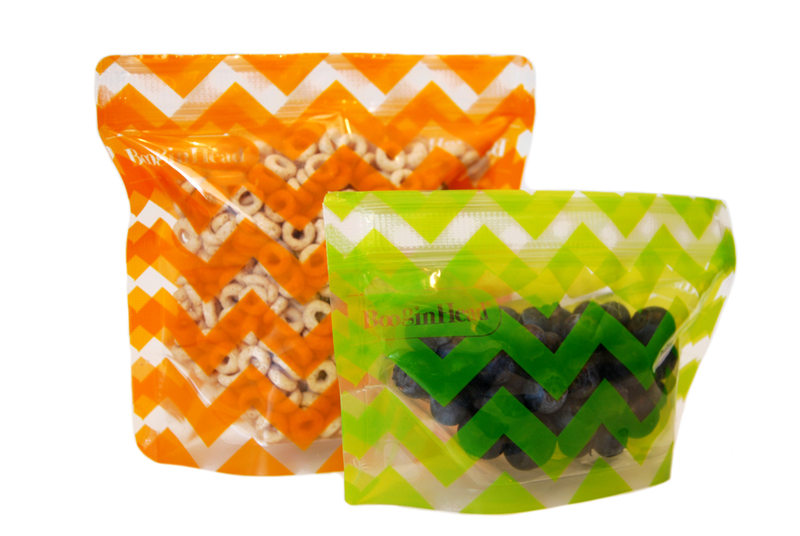 You can pack snacks, game pieces, fruit all kinds of little things and the BooginHead Pack’Ems stay closed, the bag is sturdy and pretty thick, unlike a regular disposable zipper bag, which is too thin, and yet thinner than a wet bag. It was just strong enough. The BooginHead Pack’Ems are BPA, PVC and phthalate free, and you can even clean them in the dishwasher on the top rack. They are much more economical and environmentally friendly than disposable bags and they really do work so much better. These would be great for a lunchbox and also for holding toiletries in your travel bag, they are pretty leak proof, but I don’t know that I would trust them too much next to something too important. They come in packages of 2 and you get two different sizes with each package. Destini was able to load them up with cereal and close them securely and when it was time for her to get them out she was able to open them by herself. This is an important thing, when you go out with both kids, your hands are always full, it is nice that at three she can get her own snack when we are out at the park. I think that these BooginHeads Pack’Ems would also be great for older people as well, sometimes disposable zipper bags are difficult to see and use for older people and I think these have an advantage with the printed bags and velcro like closures. Overall I think these would suit most purposes and the fact that you can throw them in the dishwasher for a thorough cleaning is such a great bonus. You can get your own great bags like this at Boogin Heads they are 9.99 for a set of TWO!